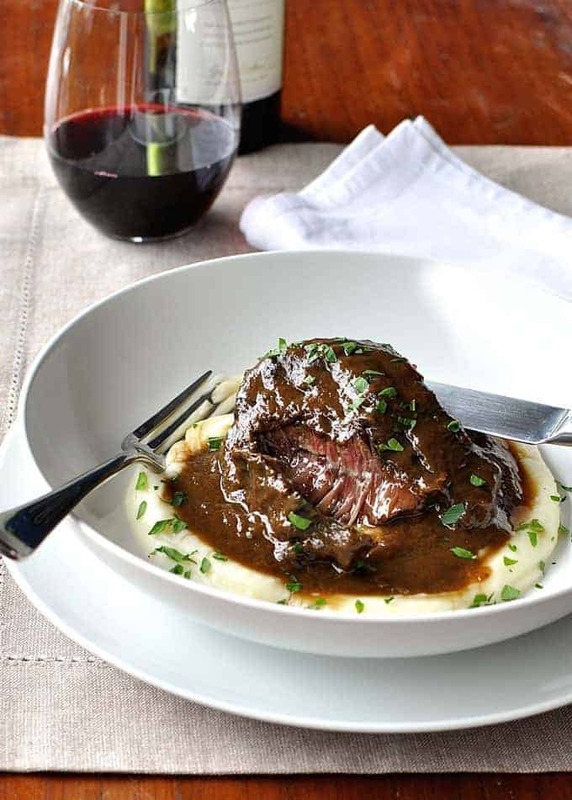 These slow cooked beef cheeks are braised in a beautiful red wine sauce. They are so meltingly tender, you can eat it with a spoon. The braising liquid is infused with incredible flavour and when pureed, transforms into a thick, luscious gravy-like sauce. Beef Cheeks are a budget cut of meat that are made for slow cooking. Perfectly accompanied with creamy mashed potatoes, this is a very easy dish that is suited to an elegant dinner party or a hearty midweek meal. Make this in your slow cooker or on the stove. Beef Cheeks are the cheek muscle of cows and they are a very tough cut of meat. It’s a budget cut that needs to be cooked long and slow to make it tender. It absorbs the flavours of braising liquid well and when you cut into it, it is stringy, almost like pulled pork or brisket. But unlike pulled pork or brisket which has patches of juicy sections and also some that can (sometimes) be a bit dry, not a single part of the beef cheek is dry. Every mouthful is juicy and luscious and even just typing up this post is making my mouth water. They aren’t always available in large supermarkets here in Australia so you might have to go to the butcher. At my butcher, it’s a bit cheaper than other slow cooking cuts like chuck steak and brisket. If you can’t find Beef Cheeks, other slow cooking beef cuts will work fine. Cut them into 250g/8oz chunks so the same cooking times and liquid quantities in this recipe will apply. 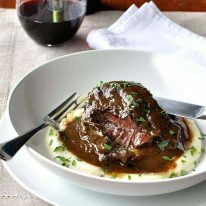 My Slow Cooked Beef Cheeks recipe is made with a classic Italian red wine braising liquid. The deep, warm, complex flavours of red wine are perfect for using as the stock base for slow cooked beef dishes. Go to your local liquor outlet and look for end of bin specials and pick up a bottle of a full bodied red wine like Merlot or Cabernet Sauvignon. A pet peeve of mine are recipes that tell you that you must use good quality drinking wine for slow cooking recipes. I do not believe that at all for slow cooked dishes. For sauces, yes, absolutely. But not for a braising liquid. I bet not even the greatest food critic in the world would be able to tell if it was a discounted $5 end of bin special or a $40 reserve Cab Sav. (Seriously. Who would make a slow cooked beef recipe using a $40 bottle of wine??). You won’t use the whole bottle. If the wine is not to your standard for drinking, measure out cups and pour them into ziplock bags and freeze them. Handy to have when you need wine for other recipes. Don’t let the length of the recipe directions fool you, this really is a simple recipe. It’s just long because I’ve provided directions for 3 different cooking methods and the mashed potatoes. This Slow Cooked Beef Cheeks is a recipe that is elegant enough for a dinner party and if made using a slow cooker, easy enough for mid week. The other great thing about these Slow Cooked Beef Cheeks is that the leftovers can be used to make fast midweek meals and over the next couple of days I’ll be sharing two recipes – a Beef Ragu Pasta (a 15 minute meal) and a Beef, Mushroom and Vegetable Pie (15 minutes of prep). Don’t you love Cook-Once-Eat-Thrice recipes?? Use this weekend to make a triple batch of beef cheeks! Save this Slow Cooked Beef Cheeks to your SLOW COOKER Pinterest Board! These slow cooked beef cheeks are so meltingly tender that you can eat them with a spoon. And the sauce is so flavourful you'll want to drink it out of a cup. This recipe makes enough to serve 6 people, made with 6 small beef cheeks (or share 4 large ones). Leftovers are brilliant to turn into a quick ragu to toss through pasta or making a pie (recipes will be posted shortly!). Prepare the beef cheeks: cut off any large, fatty membrane. Pat dry then use 1 tsp of salt and black pepper to season the beef all over. Heat 2 tbsp olive oil in a large heavy based pan (or casserole dish with a lid if you are baking or pot if you are cooking on the stove) over high heat. Sear the beef cheeks on each side until nicely browned. If your pan is not large enough, work in batches rather than crowding the pan. Remove beef cheeks onto a plate, loosely cover with foil to keep warm. Turn down the heat to medium high and heat the remaining 1 tbsp of olive oil. Add garlic, onion and carrots. Sauté for 3 minutes until onion is becoming translucent, then add the celery and sauté for a further 3 minutes. Follow directions for your chosen cooking method. Pour the onion mixture into the slow cooker and place the beef cheeks on top. Pour the wine into the fry pan and return to heat. Turn the heat up to high, bring to simmer and let it simmer for 1 minute (to cook out the wine a bit). Scrape the brown bits off the bottom of the pan so it mixes in with the wine. Pour the wine into the slow cooker, then all the remaining ingredients, starting with a pinch of salt and pepper (add more to taste later). Cook in the slow cooker on Low for 8 hours or High for 6 hours for 250g/8oz size beef cheeks or Low for 10 - 12 hours or High for 8 hours for 350g/12oz beef cheeks. Open the slow cooker and remove the beef cheeks. Discard the thyme stems and bay leaves. Use a handheld stick blender to puree the braising liquid into a smooth Sauce - it will change from a dark brown to a lighter brown colour. If using a slow cooker without a sauté setting, pour the Sauce into a saucepan. If you have a sauté setting, leave it in the slow cooker. Put the saucepan over medium heat (or set the slow cooker to sauté setting) and bring to simmer. Simmer until the Sauce turns a darker brown colour and reduces by about 1/4 to 1/3, to a gravy consistency - about 10 minutes. Do a taste test and adjust the seasoning (salt and pepper) to your taste. Remove from heat, return beef cheeks to the Sauce, cover and keep warm until ready to serve. Follow the Slow Cooker directions but cook on high in your pressure cooker for 1 hour on high for small cheeks (around 250g/8oz each). Pour the wine into the pot / casserole dish (with the onion mixture) and stir to scrape the brown bits off the bottom of the pot. Bring wine to simmer for 1 minute. Add remaining ingredients, starting with a pinch of salt and pepper (add more to taste later). Put lid on and cook on the stove on medium low for 2 to 2 1/2 hours or in the oven at 160C/320F for 3 to 3 1/2 hours until the cheeks are very tender. Turn at least once during cooking. Open the pot/casserole dish and remove the beef cheeks. Discard the thyme stems and bay leaves. Use a handheld stick blender to puree the braising liquid into a smooth Sauce - it will change from a dark brown to a lighter brown colour. Bring the Sauce to simmer over medium heat and simmer until it turns a darker brown colour and reduces by about 1/4 to 1/3, to a gravy consistency - about 3 to 5 minutes. Place potatoes in a large pot of salted boiling water and cook for 10 minutes until very soft. Turn the stove off, drain potatoes, then return to the pot. Add butter and milk and use a potato masher to mash until smooth. Add salt and pepper to taste. Use more milk to adjust the consistency to your liking. I like it fairly loose because it seems creamier (and less potato goes further). 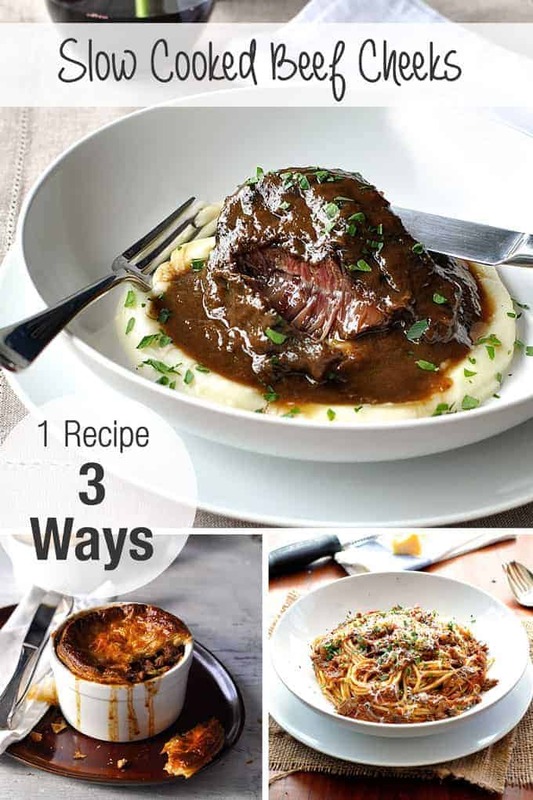 Serve beef cheeks on Creamy Mashed Potatoes, drizzled with a generous amount of Sauce. Garnish with finely chopped parsley if desired. 1. The beef cheeks I got were unusually large, around 350g/12oz each. Great man size portions. Usually beef cheeks are around 250g/8oz each and I get 6. 2. If you can't find beef cheeks, substitute with any other cut of beef suitable for slow cooking. Cut them into 250g/8oz pieces. 3. You need to use starchy potatoes for mashed potato as they breakdown when cooked, making them perfect for mashing. The best to use are Russet (common in the US), Yukon Gold, dutch creams, King Edwards or red delight. However, great all rounders like golden delight, coliban, red rascal and Sebago (popular in Australia) still works great. I use Sebago which are the brushed potatoes you can get from any supermarket in Australia (ie. the ones with dirt on them). 4. Leftover beef cheeks and sauce can be kept in the freezer for 3 months. 5. 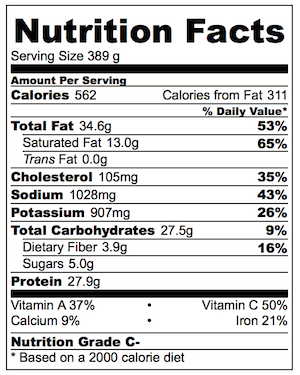 Slow Cooked Beef Cheeks nutrition per serving, excluding mashed potato. 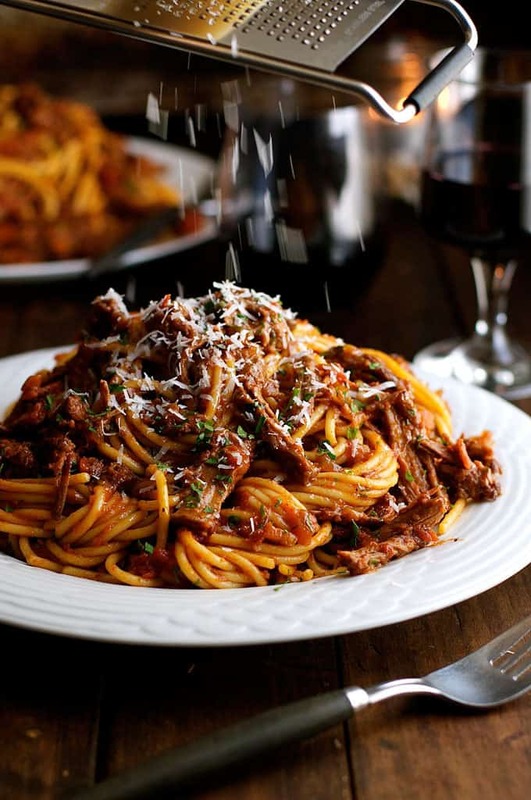 If you enjoyed these Slow Cooked Beef Cheeks, I think you’ll LOVE my slow cooked Shredded Beef Ragu Pasta! Great recipe, I marinated the meat in red wine with some spices o/night first. This is the second time I’ve made this recipe. First time I didn’t blitz the sauce but last night I did and it is really worth doing that extra step. I only used two cheeks for the two of us, and only had a cup of wine, but all the other ingredients stayed the same, just added a bit of water. A really lovely, and easy, recipe. Hi. Your beef cheek recipe looks amazing and I am going to try it out today. I was just wondering what size slow cooker the recipe is for? I have a 4Litre one. Thanks, Kirby. Hi! I love your recipes (and your gorgeous dog!!) I wondered if you’d think adding some port in to the sauce would work? I’ve used port before with beef Cheeks and wondered if it would work here? Also- to confirm- when blending the sauce that includes all the vegetables added (carrots and celery)? Thanks so much! I so so enjoy your recipes!! Cooked this for my sons 10th birthday (beefcheeks are his favourite)…..added steamed brussel sprouts as a side. Easily a 10/10. Slow cooked for 11 hours. The reduction was soooo good. Tweaked the mashed potato to my own liking….lots of butter, cream and milk. The beef cheeks were so tender, The fork would melt into them. Best beef cheeks I’ve done by far. That’s so great Jan – I’m so glad they were a hit! Will this work in a pressure cooker?? If so – how long to get it tender?? Im making it tonight with polenta – cant wait!! Cooked this a while back and it was a unanimous hit!! Trying it again this weekend. I cooked in my Aga in the Simmering oven for 12 hours and the meat just melted. Cooked with a bit of Kale for greenery which complemented well. post or еlaborating on a number of the subjects you write with regards to һere. This recipe is fantastic. Thank you so much for sharing it. This will be used many times during the cold winter months. I’m so glad you love it! The perfect winter warmer!